"Popular Song" redirects here. For the South Korean music program, see Inkigayo. For other uses, see Popular Song (disambiguation). The national prize for popular song, eventually named the Gershwin Prize, was created by Peter Kaminsky, Bob Kaminsky, Cappy McGarr, Mark Krantz, and Dalton Delan, subsequent to their creation of the national humor award, the Kennedy Center Mark Twain Prize. The project was presented to the Librarian, James Billington in 2003. The executive producers then secured a partnership with WETA, PBS, and CPB. The Librarian bestowed the first award in 2007 to recognize "the profound and positive effect of popular music on the world’s culture" as part of the Library's mission to recognize and celebrate creativity. The recipient of the Gershwin Prize is said to "exemplify the standard of excellence associated with the Gershwins." In selecting the honoree, the Librarian of Congress works with staff of the Library's Music Division as well as the broader music community. On March 1, 2007, the Library announced Paul Simon as the first honoree of the new award, which joins other awards bestowed by the Library including the Living Legend and Kluge Prize. Simon received the Prize during a concert gala featuring his music at the Warner Theatre in Washington, D.C., on the evening of May 23, 2007. The event was nationally broadcast on PBS the evening of June 27, 2007. Performers included Yolanda Adams, Marc Anthony, Shawn Colvin, The Dixie Hummingbirds, Jessy Dixon and the Jessy Dixon Singers, Jerry Douglas, Philip Glass, Alison Krauss, Ladysmith Black Mambazo, Lyle Lovett, Stephen Marley, Dianne Reeves, James Taylor, Stevie Wonder, and Buckwheat Zydeco, as well as Simon's former collaborator Art Garfunkel. On September 3, 2008, the Library announced that Stevie Wonder would become the second recipient of the honor. President Barack Obama presented Wonder with the Library of Congress' Gershwin Prize at a February 25, 2009 White House ceremony. Performers included Wonder as well as India.Arie, Tony Bennett, Wayne Brady, Anita Johnson, Diana Krall, Mary Mary, Martina McBride, Rickey Minor, Paul Simon, Esperanza Spalding and will.i.am. On November 18, 2009, the Library announced Sir Paul McCartney as the third recipient of the honor. The ceremony for McCartney was held June 2, 2010, in the East Room of the White House with President Obama and Mrs. Obama in attendance. Performers included McCartney as well as Stevie Wonder, Elvis Costello, Jonas Brothers, Herbie Hancock, Corinne Bailey Rae, Dave Grohl, Faith Hill, Emmylou Harris, Lang Lang and Jack White, with remarks by Jerry Seinfeld. On September 27, 2011, the Library announced Burt Bacharach and Hal David as the fourth recipients of the honor. The presentation ceremony was May 9, 2012, during a White House tribute concert (recorded for later broadcast on PBS) with the President and Mrs. Obama in attendance. Performers included Stevie Wonder, Diana Krall, Lyle Lovett, Sheléa, Rumer, Sheryl Crow, Mike Myers, Arturo Sandoval, and Michael Feinstein, who spoke of Ira Gershwin's admiration of the pair's songs. The singer most closely associated with the Bacharach-David songbook, Dionne Warwick, sang “This Guy’s in Love With You” which was not included in the PBS broadcast. On December 13, 2012, Carole King became the honoree of the fifth Gershwin Prize, the first time it was awarded to a woman composer. Tuesday, May 21, 2013, The Library hosted an invitation-only concert at Coolidge Auditorium in honor of King. The all-star tribute included performances by Siedah Garrett, Colbie Caillat, Gian Marco, Shelby Lynne, Patti Austin, Arturo Sandoval and King's daughter, Louise Goffin. The following night at the White House, the First Family joined King and star performers including James Taylor, Gloria Estefan, Emeli Sandé, Trisha Yearwood, Jesse McCartney and Billy Joel. On July 22, 2014, Billy Joel was announced as the sixth honoree of the Gershwin Prize, named by the Librarian of Congress under advisement of Library of Congress subject matter experts and an expanded advisory board that included Mary Chapin Carpenter (songwriter), Wesley Bulla (Belmont University), Anthony DeCurtis (Rolling Stone Magazine), Emilio Estefan (producer), Gregg Field (producer), Ed Hardy (CMA), Joel Katz (Global Entertainment), Stinson Liles (brand advisor), Rickey Minor (music director), Neil Portnow (President/CEO NARAS), Karen Sherry (ASCAP Foundation), Michael Strunsky (Ira and Leonore Gershwin Trusts) and Michelynn Woodard (Dr. Phil Foundation). The honor ceremony along with a concert was held in Washington D.C. at DAR Constitution Hall November 19, 2014, and aired by PBS January 2, 2015. Kevin Spacey acted as emcee and Twyla Tharp (Twyla Tharp’s “Movin’ Out) and Sir Paul McCartney gave special verbal tributes. Performers included Boyz 2 Men (The Longest Time), Leann Rimes ("Lullabye (Goodnight, My Angel),"), Josh Groban (She's Always a Woman), Gavin DeGraw (It's Still Rock And Roll To Me), Michael Feinstein, Natalie Maines (She's Got A Way), John Mellencamp (Allentown) and Tony Bennett (New York State of Mind). Joel ended the night by performing four songs: "Miami 2017 (Seen the Lights Go Down on Broadway)," "Vienna," "You May Be Right" and "Movin' Out (Anthony's Song))." The show's finale was Kevin Spacey leading the performers singing Piano Man. Smokey Robinson was named the 2016 honoree. Tony Bennett was the 2017 honoree. Following Tony Bennett, there was no honoree in 2018 and it was announced that the next honorees of the prize will be the husband and wife team of Emilio Estefan and Gloria Estefan. They will receive the prize in March 2019 at an all-star tribute concert in Washington, D.C. The concert will air on PBS stations nationwide in spring 2019 (a broadcast date is to be determined). ^ a b c "Paul Simon To Be Awarded First Annual Gershwin Prize for Popular Song by Library of Congress" (Press release). Library of Congress. 2 July 2007. Retrieved 2015-01-04. ^ "Star-Studded Lineup Confirmed for Library of Congress Concert Honoring Gershwin Prize Recipient Paul Simon" (Press release). Library of Congress. 23 April 2007. Retrieved 2015-01-04. ^ "Singer/Songwriter Stevie Wonder Named Recipient of Library of Congress Gershwin Prize" (Press release). September 2, 2008. ^ "Stevie Wonder honoured by Obama". BBC News. 26 February 2009. Retrieved 2015-01-04. ^ "Sir Paul to receive top US honour". BBC News. 18 November 2009. Retrieved 2015-01-04. ^ Pareles, Jon (June 2, 2010). "McCartney Is Honored at White House". The New York Times. Retrieved 2015-01-04. ^ "Burt Bacharach, Hal David Named Recipients of Fourth Library of Congress Gershwin Prize for Popular Song" (Press release). Library of Congress. 28 September 2011. Retrieved 2015-01-04. ^ Lewis, Randy (May 9, 2012). "Hal David, Burt Bacharach honored in D.C. with Gershwin Prize". Los Angeles Times. Retrieved 2015-01-04. ^ "President and First Lady to Host Concert Honoring Carole King in the East Room" (Press release). The White House. 22 May 2013. Retrieved 2015-01-04. ^ Desta, Yohana (21 May 2013). "Carole King on Gershwin Prize: 'Do not make me cry'". USA Today. Retrieved 2015-01-04. ^ Hetrick, Adam (28 May 2013). "'Carole King White House Concert, With Billy Joel and James Taylor, Broadcast on PBS May 28'". Playbill. Archived from the original on 8 June 2013. Retrieved 28 May 2013. ^ "Billy Joel to Receive Library of Congress' Gershwin Prize". Rolling Stone. ^ Frances Stead Sellers (20 November 2014). "Billy Joel's Gershwin Prize for Popular Song brings out the big shots". Washington Post. ^ "Billy Joel to Receive Gershwin Prize - News Releases - Library of Congress". loc.gov. ^ "Billy Joel Receives The 2015 Gershwin Prize For Popular Song". The Inquisitr News. ^ BWW News Desk. "Billy Joel Honored With 2014 Library of Congress Gershwin Prize for Popular Song; Concert to Air 1/2 on PBS". broadwayworld.com. ^ a b "Billy Joel". Billy Joel. ^ Tucker, Neely (22 July 2014). 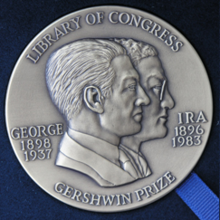 "Billy Joel to receive Gershwin Prize for Popular Song from Library of Congress". The Washington Post. Retrieved 2015-01-04. ^ "Bulla Invited to Serve as Executive Advisor for Gershwin Prize" (Press release). Belmont University. 16 December 2014. Retrieved 2015-10-27. ^ "The Gershwin Prize Billy Joel - Gershwin Prize - PBS". The Gershwin Prize Billy Joel - Gershwin Prize - PBS. ^ "Billy Joel, Popular Song, PBS, And Needing A Piano". NPR.org. 2 January 2015. ^ "Watch Kevin Spacey Perform 'Piano Man' With Billy Joel". Rolling Stone. ^ a b "Tony Bennett - 2017 Gershwin Prize Honoree". Library of Congress. Library of Congress. Retrieved 6 February 2019. ^ a b "Emilio and Gloria Estefan - 2019 Gershwin Prize Honorees". Library of Congress. Library of Congress. Retrieved 6 February 2019. ^ "Paul Simon - 2007 Gershwin Prize Honoree". Library of Congress. Library of Congress. Retrieved 6 February 2019. ^ "Stevie Wonder - 2009 Gershwin Prize Honoree". Library of Congress. Library of Congress. Retrieved 6 February 2019. ^ "Paul McCartney - 2010 Gershwin Prize Honoree". Library of Congress. Library of Congress. Retrieved 6 February 2019. ^ "Burt Bacharach - 2012 Gershwin Prize Honoree". Library of Congress. Library of Congress. Retrieved 6 February 2019. ^ "Hal David - 2012 Gershwin Prize Honoree". Library of Congress. Library of Congress. Retrieved 6 February 2019. ^ "Carole King - 2013 Gershwin Prize Honoree". Library of Congress. Library of Congress. Retrieved 6 February 2019. ^ "Billy Joel - 2014 Gershwin Prize Honoree". Library of Congress. Library of Congress. Retrieved 6 February 2019. ^ "Willie Nelson - 2015 Gershwin Prize Honoree". Library of Congress. Library of Congress. Retrieved 6 February 2019. ^ "Smokey Robinson - 2016 Gershwin Prize Honoree". Library of Congress. Library of Congress. Retrieved 6 February 2019.